Recently, after returning from a farmers market all sweaty and out of breath, I suddenly had an "aha!" that I had to share. Don't you just love having an "aha"? (Or what I call a spiritual download). I was surprised when a bunch of friends who don't know each other asked me to go with them to the farmers market to help them pick out flowers. "Your arrangements always look so nice; mine are all over the place. Help!" they'd ask. I thought, well, if they didn't know how to pick flowers that surprise and delight, how many of you out there need inspiration? 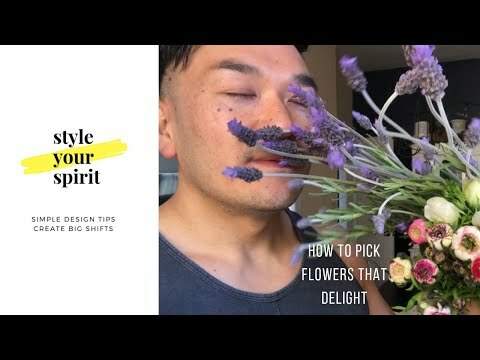 I knew I had to share this knowledge when a fellow soul and style sister, Sophia, who used to decorate storefront windows at Anthropologie, asked me to share what I know about flower power and how to pick and arrange these pretty little petals. She told me many of her friends also didn't know where to begin. So many flowers, so little time! 1. Pay attention to what you gravitate toward. You have a natural GPS that excites you and draws you to certain colors or shapes. 2. Let nature be your guide to choosing colors that go together. Like picking a focal point, pick a focal flower. 3. Go with your gut. Pick a flower that you connect with. If you're feeling simple, just stop there. These lovely yellow flowers below look gorgeous in a wabi-sabi navy blue bowl. If you're feeling a bit extra and want to create a bouquet, pay attention to the first bunch of flowers you picked. I chose ranunculus that have a great combination of white, yellow, purple and pink. I then pulled from those colors and chose lavender for its purple color and anemones for the yellow and white. When I decorate a room for myself or a client, I ask, "What would you like your focal point to be?" Generally, it's a piece of art or tapestry. Then we pick colors that are pulled from that palate for pillows, blankets, pottery etc., to accessorize. I not only love how flowers bring new life, energy and color to my space, I literally feel the energy and love they emit. When choosing florals for my home, I can't help but think about how I'm allowing nature to guide me in my personal, professional and spiritual lives. Do I feel stuck in the process of choosing flowers? Likewise, do I feel stuck when making important decisions in my personal, professional and spiritual lives? Florals also inspire me to remember to spend more time in nature. Do you have a method of picking flowers for your home? I'd love to know. Please share in the comments below. 1. Buy flowers for you and friends often. 2. Go with your gut when choosing them. 3. When you aren't feeling the florals or even a decision in your life, you do you boo. Listen to your gut, not your head. Pay attention to that feeling of "bliss" or "blah!" Wondering how I arranged these flowers? Stay tuned for the next episode, when I talk about how to arrange flowers that suit your current place and mood.